As day slips softly into night, sharp eyes catch glimpses of the special creatures who are active at dusk. 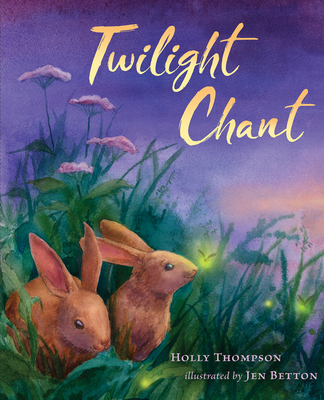 Lyrical text and lush art capture the richness and life of this magical time in a sumptuous picture book that will inspire budding naturalists and anyone who has ever chased a lightning bug at twilight. An author’s note about twilight is included. Holly Thompson was raised in New England and is a longtime resident of Japan. The author of the children’s novels in verse Falling Into the Dragon’s Mouth, The Language Inside, and Orchards, Holly teaches creative writing and splits her time between Japan and Massachusetts. Visit her online at hatbooks.com and on Twitter at @hatbooks. Jen Betton is a freelance illustrator and college art instructor. She holds a BFA in painting from the University of Central Florida and an MFA in Illustration from Syracuse University. Twilight Chant is the first picture book she has illustrated. She lives in Arlington, MA. Visit her online at jenbetton.com and on Twitter @JenBetton.